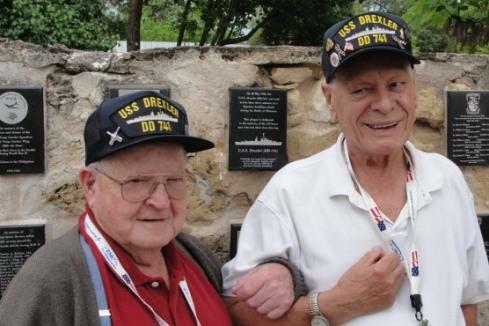 Six Drexler (DD-741) survivors met together in San Antonio to remember the 65th anniversary of their destroyer's sinking by two kamikaze planes that killed 158 and wounded 52. Duke Payne, a Drexler survivor who now lives in San Antonio, served as hometown host for over 40 people who attended all or part of the Drexler Survivors Reunion from May 13 to 17, 2010. Mike Smith, grandson of Delmar Bailey who was killed in the kamikaze attack, has attended every one of the 25 annual Drexler reunions along with his parents Jack and Lucinda Smith. He showed his Drexler cap weighted down with pins from prior reunion locations. He and his parents drove all the way from Virginia to San Antonio to bring donated raffle prizes and Drexler's historical photographs and documents, available for viewing throughout the reunion. The 65th Anniversary Memorial Service took place on Friday at the National Museum of the Pacific War in Fredericksburg, Texas. Due to unexpected torrential rains in the San Antonio area, the bus trip to the museum took longer than expected, so the service started about a half hour after the planned time of noon and took place inside due to threatening weather. After a color guard presentation and invocation, several individuals read the names of those who died in the kamikaze attack and then those who have passed away since that date. I was saddened to hear the names of Joe Curgino, who I had interviewed in a Chicago suburb in 2006 (his story in Little Italy to Okinawa), and Lloyd "Red" Brantley, who along with his wife had accompanied my wife and me to dinner one night at the 2006 USS Drexler Survivors Reunion. 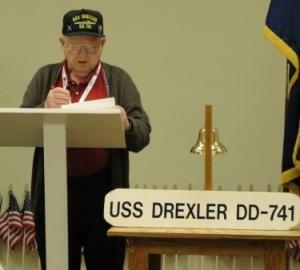 The ceremony made me realize how few Drexler survivors are still living. During the luncheon after the memorial service, we had the honor to talk with some men and women currently serving in our country's military at bases in the San Antonio area. After lunch, we tried to tour the grounds of the huge National Museum of the Pacific War in about two hours. 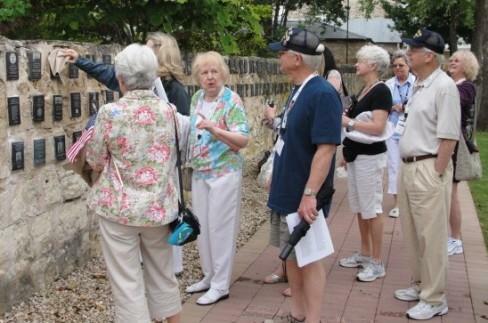 Most of the group first went searching for Drexler's plaque in the courtyard among over 1,200 commemorative plaques honoring ships, individuals, and units that served in the Pacific War. The small plaque, put up in 1992 on the Memorial Wall, turned out to be a challenge to find even for those who knew the general direction. When the group located the plaque, someone pulled out a cloth and cleaned off some dirt from it. On 28 May 1945, the U.S.S. 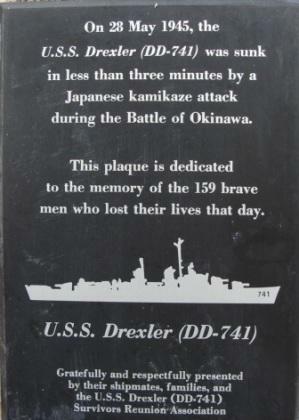 Drexler (DD-741) was sunk in less than three minutes by a Japanese kamikaze attack during the Battle of Okinawa. This plaque is dedicated to the memory of the 159 brave men who lost their lives that day. It is unusual that the plaque states 159 men died since all other sources indicate 158 men died. Next Gene Brick took several of us to the single 5-inch gun outside the museum entrance and explained how it operated. He served as trainer on Drexler's twin 5-inch Mount #2, one of the two twin mounts in the front part of the destroyer. I then took a stroll around the courtyard to view plaques of other ships I recognized. Several ships sunk or severely damaged by Japanese kamikazes had plaques to remember the attacks and deaths, including Callaghan (DD-792), Sangamon (CVE-26), Bush (DD-529), Hugh W. Hadley (DD-774), and Suwannee (CVE-27). Only about an hour remained when I finally entered the huge museum with 36 exhibit areas, so I only had time to look in detail at exhibits in two or three areas. The Pearl Harbor gallery displays the midget submarine piloted by Kazuo Sakamaki, who became America's first prisoner of war of World War II after his midget submarine ran aground when its gyrocompass malfunctioned. The gallery on Okinawa has an exhibit of destroyer Hugh W. Hadley's Combat Information Center (CIC), which was assigned to detect approaching enemy aircraft and coordinate with Combat Air Patrol (CAP) to intercept them. On May 11, 1945, Hadley shot down 23 planes in one hour and 40 minutes, a record for number of planes downed in a single engagement. On Saturday morning the Drexler Survivors Reunion Association held its business meeting and decided on Seattle as the 2011 reunion site. In the afternoon while talking with survivor Gene Brick about his latest wartime research, I had the honor of meeting and talking with Dr. Rex Davis, still working part-time at the age of 84. His landing craft, LCS(L) 114, picked up 119 men from the water when Drexler sank after hits by two kamikaze aircraft. His story entitled May 28, 1945—Another Day of Infamy tells about that day's events. On Saturday evening about 40 persons gathered for the banquet dinner at the historic Menger Hotel, where most of the group stayed during the reunion. The hotel's downtown location next to the Alamo and a short walk from the San Antonio Riverwalk made it convenient for sightseeing, eating, and shopping. After we finished eating dinner, Bartt Brick, son of survivor Gene Brick, did an excellent job keeping everyone laughing as he communicated winners of raffle prizes donated by association members to raise money for the organization. On Sunday we took a bus tour of San Antonio. The recently restored Japanese Sunken Gardens, called the Chinese Sunken Gardens during the war against Japan, was our first destination. Next we visited Mission San José, founded in 1720, as light rain started to fall. Our next stop was near our hotel at the Buckhorn Saloon and Museum and the Texas Ranger Museum located in the same building. The tour ended with a rather boring shopping excursion to San Antonio's El Mercado (Market Square). During this reunion I had a chance to chat with Gerry Lewis, whose father Elmer Lewis died when two kamikaze aircraft hit and sank Drexler. Gerry and his sister Sandra Grice were six and eight years old respectively when their mother received a telegram in August 1945 that their father was missing in action and presumed dead. They grew up thinking that everyone or almost everyone aboard ship had been killed, but in 1997 he discovered the Drexler Survivors Reunion Association when his daughter found a photo and information about the destroyer Drexler on the Internet while working on a college project. He said, "Finding this reunion group was a life-changing event for us." He and his sister attended their first reunion in 1998 in Corpus Christi, and they have regularly attended subsequent reunions. The interactions with survivors and other Drexler family members have helped them in the healing process since their mother, who remarried in 1950, did not talk about the sinking. The only slight disappointment has been that no survivor knew much about their father other than recognizing his face, probably since he was 35 years old when Drexler sank, and most other crewmen were in their late teens and early twenties. The older crewmen tended to hang out together, so the younger ones did not have too much interaction with them.